"Pratchett . . . has a satirist's instinct for the absurd and a cartoonist's eye for the telling detail." "The purely funniest English writer since Wodehouse." Sam Vimes, watch commander of Ankh-Morpork, is at long last taking a much-needed (and well deserved) vacation. But, of course, this is Discworld®, where nothing goes as planned—and before Vimes can even change his cardboard-soled boots for vacationer's slippers, the gruff watch commander soon finds himself enmeshed in a fresh fiasco fraught with magic, cunning, daring, and (for the reader more than for poor Vimes) endless hilarity. Did he really expect time off? As Vimes himself says in Feet of Clay, "there's some magical creature called 'overtime,' only no one's even seen its footprints." 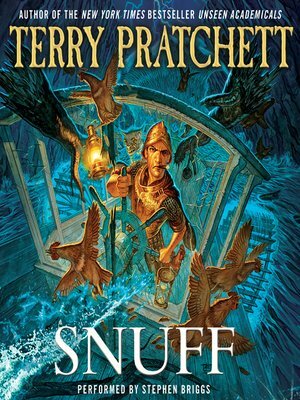 Following the New York Times bestselling Unseen Academichals, Terry Pratchett delivers an enthralling new tale from a place of insuperable adventure: Discworld. Discworld® is a registered trademark.